Stir together 6 cups white flour, 2 cups whole wheat flour, 1/4 cup sugar, 2 teaspoons salt, and 5 tablespoons baking powder. Store the mix in a sealable jar. Print out the label on the previous page. Write your name on it and tape it to the front of the jar. Add directions – priint out the pancake batter directions below and tape them to the back of the jar. Pancake mix – In a large bowl, mix 1 cup of mix, 2 eggs, 3/4 cup milk, and 1 tablespoon melted butter. Melt a little butter in frying pan over medium heat. Spoon the batter into the pan and cook until you see bubbles. Flip and cook the second side. Serve with maple syrup. 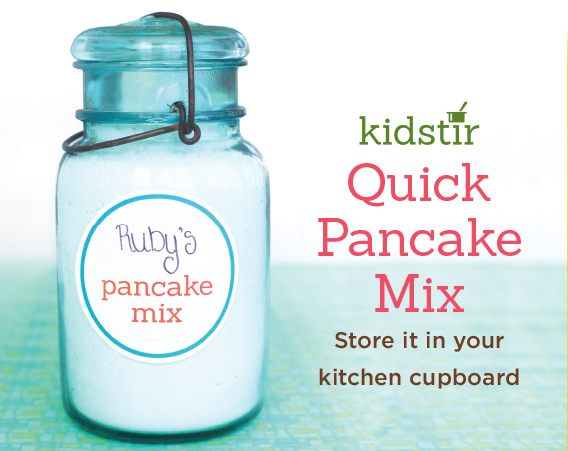 Love the pancakes from your Good Morning Kidstir kit? Use this label and directions below to make a jar of pancake mix for your pantry! Pancake Mix – In a large bowl, mix 2 cups of mix, 2 eggs, 2 cups buttermilk, and 2 tablespoons melted butter. If it’s too thick, add a little extra buttermilk. Melt a little butter in frying pan over medium heat. Spoon the batter into the pan and cook until you see bubbles. Flip and cook the second side. Serve with maple syrup.